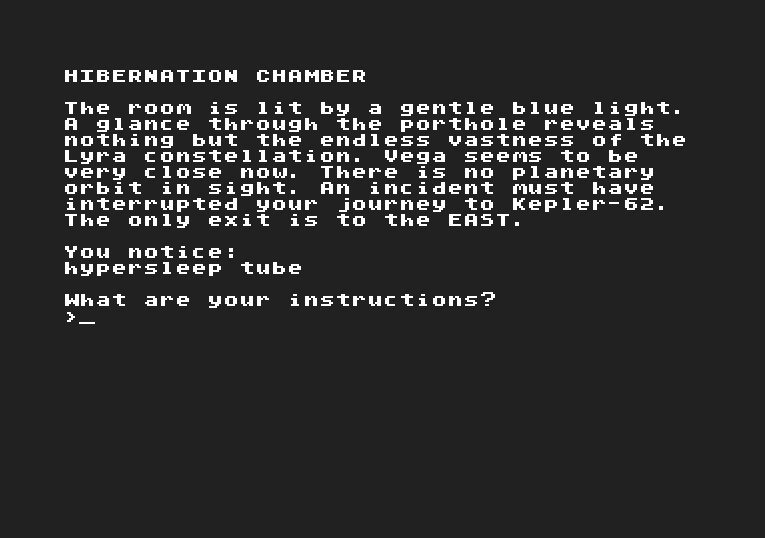 Have you ever dreamed about a journey far beyond the known regions of the universe? Close to Vega, Olivia Lund is on the trail of one of mankind's greatest secrets and a thousand-year-old mystery. 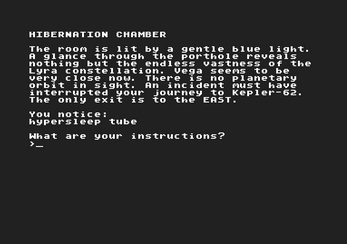 After over 200 years in hypersleep, she wakes up alone on her stranded ship, the Polaris-7. The artificial intelligence Io seems to be her only remaining friend now. 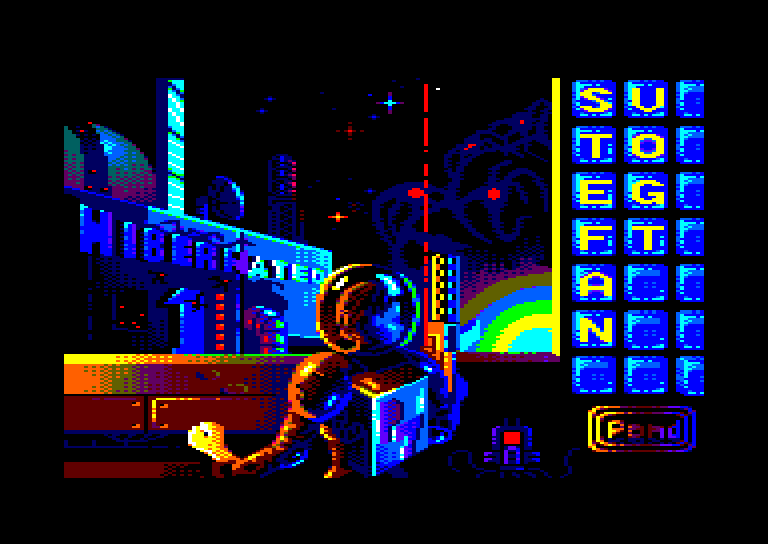 Commodore 64, ZX Spectrum, Amstrad CPC, Amiga, Atari ST and DOS. Hibernated 1 is also available as a physical release with extra goodies, including an addon called "Eight Feet Under" from Poly.Play. You can order it here. The game won the legendary Crash Smash award in the Crash Annual, and received an outstanding score of 87% in the Zzap!64 Annual of 2019. 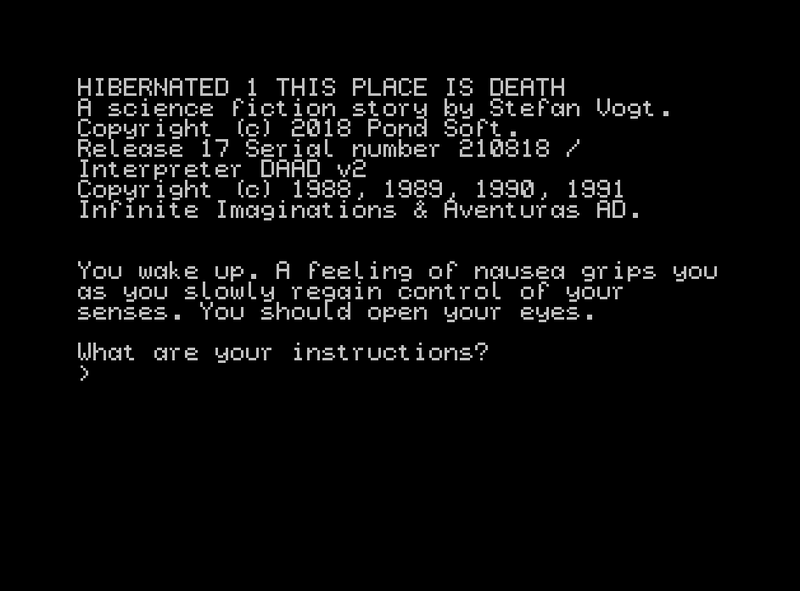 Hibernated 1: This Place is Death is following the paths of the legendary adventures from Infocom and Level 9, but it tries to meet modern era expectations, so that the most profound game genre of the 80s still works today. 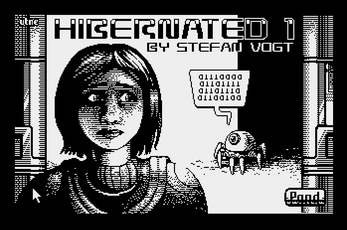 Hibernated is a text-only adventure. It works with a two-word-logic, e.g. 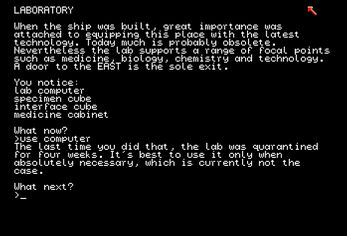 EAT APPLE, EXAMINE CUPBOARD. 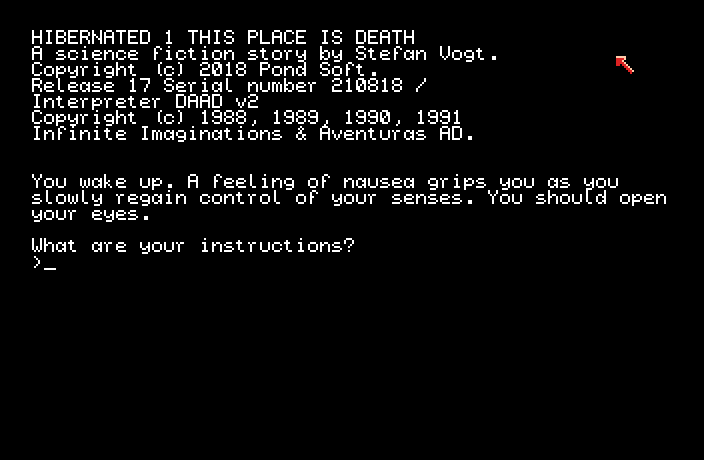 The parser is capable tough to understand better forms of expression. 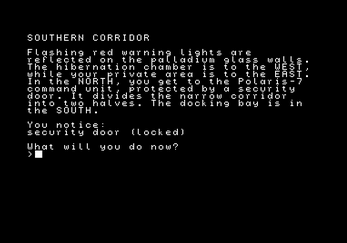 So you could write N to go north, you could also write GO NORTH. 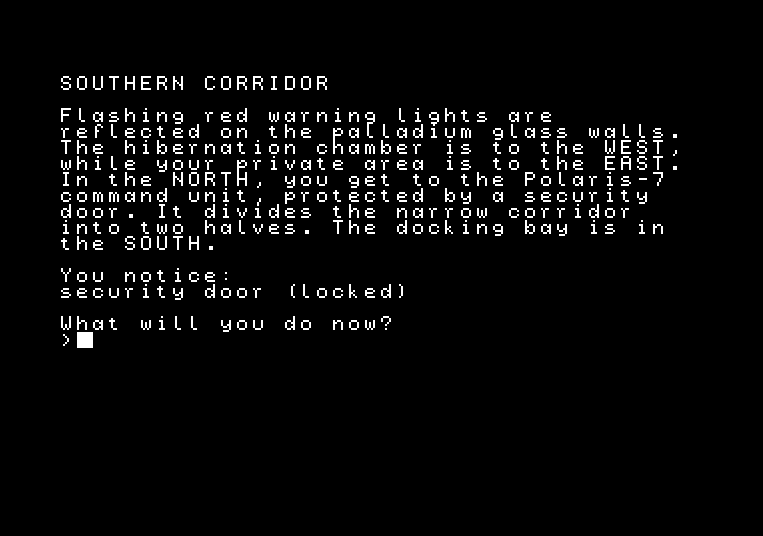 You generally move with N(orth), S(outh), W(est), E(east) or any other direction that is written in the room description like e.g. UP or SE. You don't have to search for hidden exits, everything is clearly visible to you. A door though might be locked, which is a different cup of tea. Hit INVENTORY to have a look at the items you're carrying. QUIT or STOP allows you to return to Basic. * Draw a map. 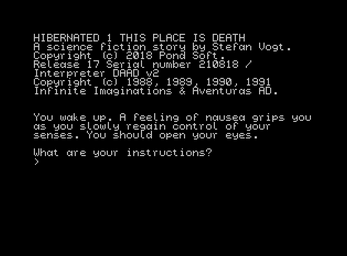 That's probably the most important aspect to win this game, Hibernated doesn't differ much in that from other text adventures. * Keep your progress in mind. 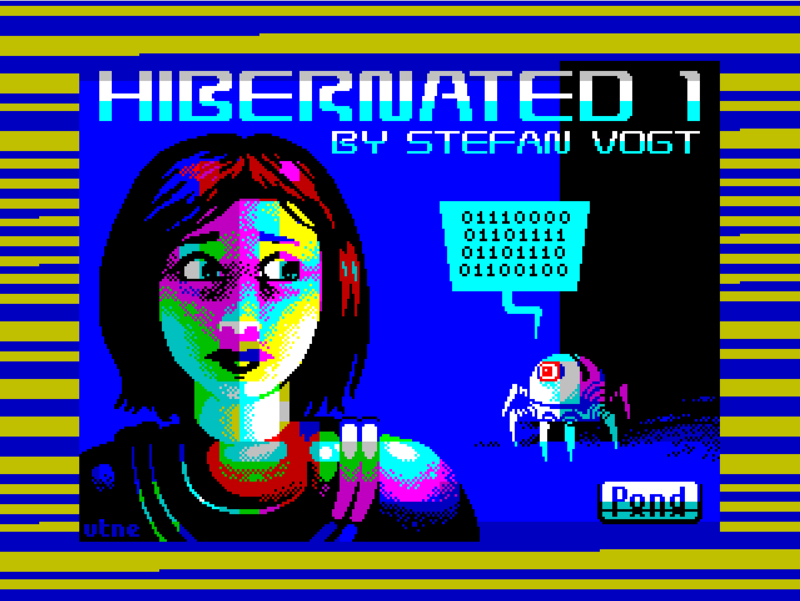 Hibernated is heavily based on dependencies and progress levels. You might have the right idea (verb noun combination) but the time is wrong. Just because an operation doesn't work does not necessarily mean it won't work later, e.g. why should you USE TOILET if there is no need for that? Why should you SEARCH for TOILETPAPER if you don't need it? Io sometimes gives you hints about the steps necessary for the progression. And sometimes, even the time is right, the idea is right but the place is wrong. That's also for you to consider. If you want to take a shower, you go to the bathroom. Yes, that was a metaphor. * Examine a lot. Not only does examining give you useful hints - and think twice about what you read, Hibernated comes also with a lot of hilarious jokes and references. So be sure to examine everything, including the objects you carry and encounter as you might be otherwise missing most of the fun. * Searching rooms is not a thing, e.g. SEARCH AREA. 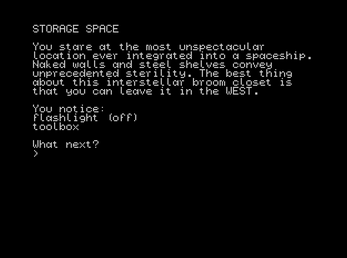 Searching an object though is fine, e.g. SEARCH CUPBOARD. * Use a shortcut. 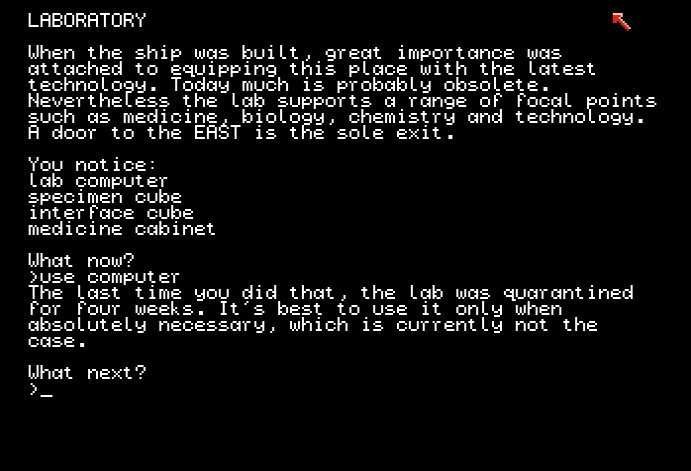 On the alien ship you can type anytime GO POLARIS to get back to the Polaris-7 with skipping all the rooms in-between. You will need to go back quite a few times so this is a VERY handy feature. 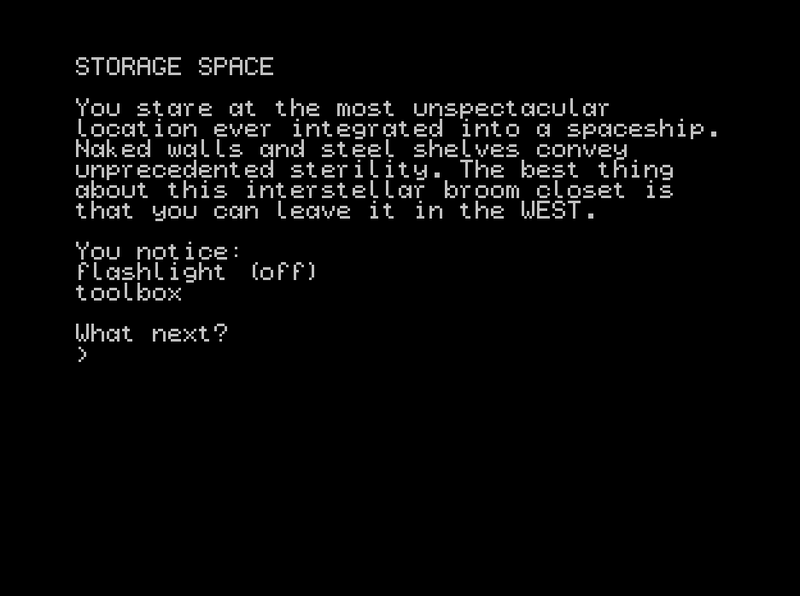 The feature won't work if you're not wearing your space suit as that would result in a gameplay paradoxon. Also it makes sense in a logical context. When you're in outer space you're not only wearing your old worn-out underpants. * This game does not contain any references to Colossal Cave Adventure. Ok, there might be at least one in. * Don't die. 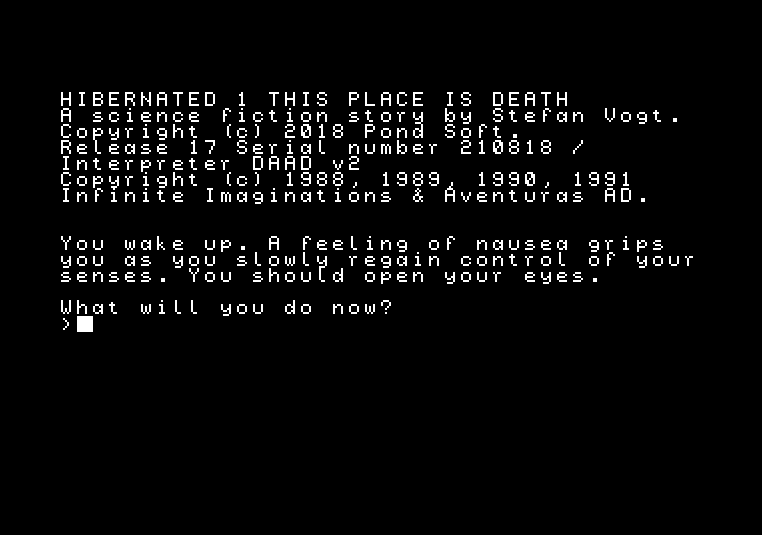 There is JUST ONE situation in the game where you can actually die and it is not very hard to guess how that might be achieved. 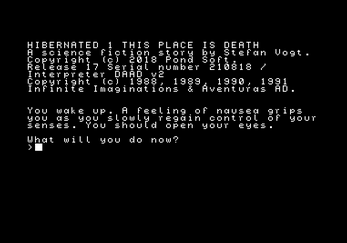 If you manage to die in that one situation, you probably might want to consider to not play any adventure game in the future. 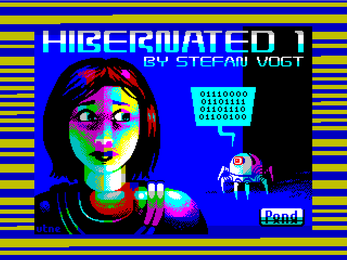 A solution for Hibernated 1 is available at CASA. 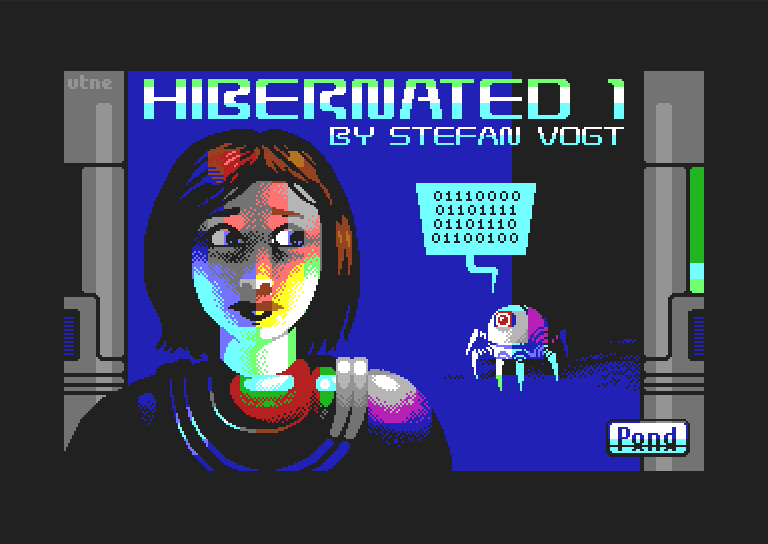 Hibernated 1 is (c) 2018 Stefan Vogt and Pond Software Ltd.